Nuthatch, Castle Farm Cottages in Dudleston, near Ellesmere sleeps 4 people. A fantastic conversion set in Dudleston at the heart of North Shropshire. These two semi-detached barn conversions (29363 and 29364), adjacent to the owners’ home, are set in a quiet and peaceful location - an ideal holiday base for exploring Shropshire and the surrounding borderland counties of Cheshire and North Wales. Guests will be able to enjoy the hot tub within the shared grounds and each property has its own private designated patio areas. Nearby tourist attractions include the picturesque Ellesmere Lakes, Old Hill Fort Oswestry, Park Hall working farm and Hawkstone Park. Go go-karting, paintballing and canoeing on the Shropshire canal, or visit historic Shrewsbury, with the River Severn flowing through. Across the border is North Wales, where guests will find Chirk Castle and Erddig (National Trust). The popular town of Llangollen is famous for its Eisteddfod motor museum, horse drawn barges and canal boat rides, plus the steam railway and white water rafting. In Cheshire, visit Chester Zoo, Bangor-on-Dee and Chester race courses. Also Pistyll Rhaeadr, the highest waterfall in Wales is close to Oswestry. Shop, pub and restaurant 3 miles. Ground floor: Living/dining room/kitchen. 1 double bedroom with en-suite bathroom with shower over bath and toilet. First floor: 1 twin bedroom with en-suite bathroom with shower over bath and toilet. Both properties: Electric woodburner in living room included. Oil central heating, electric, bed linen and towels included. Cot and high-chair on request. DVD. Electric cooker. Microwave. Washing machine. Dish washer. Fridge/Freezer. Wi-Fi. Patio. Shared grounds. Parking (2 cars). Cycle store. Shared hot tub. Kennel available. No smoking. Holidays run from Friday to Friday. For a better idea of where Castle Farm Cottages - Nuthatch is, you can see Castle Farm Cottages - Nuthatch on the map below. 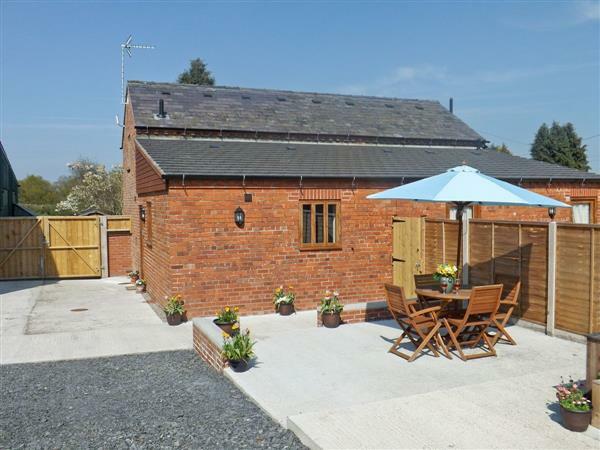 Castle Farm Cottages - Nuthatch is in Shropshire; should you be on the lookout for a special offer, you can find all the special offers in Shropshire. It's always worth checking to see what is on offer at the moment. Do you want to holiday near Castle Farm Cottages - Nuthatch (29363), you can see other cottages within 25 miles of Castle Farm Cottages - Nuthatch; have a look to find your perfect holiday location.